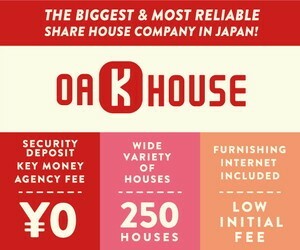 A guesthouse (or "gaijin house", meaning "foreigner house") is an inexpensive type of accommodation for foreigners, who stay in Japan for one month or longer and who want to avoid the hassle and the expense of renting and furnishing a conventional apartment. Some guesthouses also offer weekly contracts. There are many guesthouses in Tokyo, but they can also be found in other major Japanese cities. While some are single, independently managed houses, others are owned by realty companies that operate multiple houses across the city. Some companies maintain a "foreigners only" policy. Depending on the room and company, the monthly rent for a shared apartment in Tokyo is typically between 40,000 and 100,000 yen per person and month, while a private apartment usually costs at least 100,000 yen per month. Whether cost for utilities is included depends on the company. Guesthouses do not tend to be the newest or most modern buildings, although the apartments are usually equipped with basic kitchen utensils, a futon, a pay phone, and possibly a television. By living in a guesthouse, a foreigner has the opportunity to closely experience Japanese everyday life, buy food and household goods in Japanese supermarkets, dispose of garbage in the correct way, etc. Well-furnished guest house; Air-conditioned, TV, refrigerator, bed and Internet connection. Free PC in the lounge room! Single room/Share room. Cozy budget guesthouse in Tokyo. Furnished rooms. No guarantor or huge rental deposit required. Short and long stays okay.